Vanessa Gathers smiling as she leaves a New York courtroom after learning that her manslaughter conviction had been overturned. On November 18, 1991, 71-year-old Michael Shaw was assaulted and robbed. He would succumb to his injuries on n April 21, 1992. In 1992, now retired NYPD Detective Louis Scarcella questioned Vanessa Gathers. Gathers told police she had nothing to do with the crime. Five years later, Scarcella questioned Gathers again and coerced her into a confession that put her in prison for 10 years. In March of 2007, Gathers, 58, was released on parole, which ended in 2012. 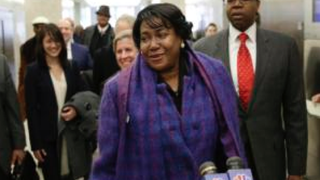 On Tuesday, Gathers was cleared of any wrongdoing and has her felony record cleared after prosecutors concluded her since-recanted confession was false, peppered with facts that didn't add up as Scarcella tactics have now come under question, according to the Associated Press. "After a thorough and fair review of the case … the manslaughter conviction against Vanessa Gathers should not stand and that she should be given back her good name," said Brooklyn District Attorney Ken Thompson in a statement, the New York Daily News reports. Although Gathers is the first to be exonerated, Brooklyn prosecutors are expected to revisit about 100 cases, 70 of which have been tied to Scarcella, who denies any wrongdoing. "Detective Scarcella followed the law as it relates to taking statements from suspects and did not do anything improper," his lawyers, Alan Abramson and Joel Cohen, told AP Tuesday. AP notes that Gathers left the court in tears, "I feel great," she said. As for what she would do next: "Go on with my life." Read more at Associated Press and New York Daily News.